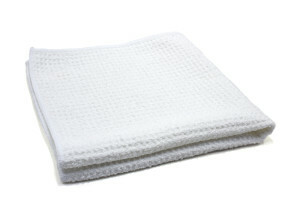 These are our original light weight waffle weave microfiber drying towels. This car towel is large enough to dry one car and light enough to be easy to handle even with fully saturated (when large microfiber towels become wet they can become too heavy). The waffle towels have a weave construction that absorbs water at a faster rate because as the towel travels across the surface the ridges of the waffle trap the water and scoop it into the super absorbent microscopic fibers. The low pile of this microfiber drying towel minimizes lint and streaking which makes this towel a perfect choice for cleaning windows and mirrors. 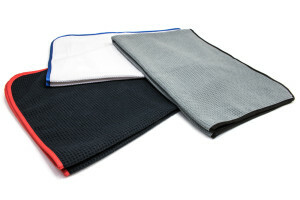 Waffle microfiber drying towels can absorb over 7 times their weight in water, and a single towel can dry an entire small sized car. This waffle weave drying towel is great as a pet drying towel!